Do you know about our NotezWorthy Ratings system yet? You might already be featured as one of our NotezWorthy Top 10 Indie Charts! On the top of every audio, video, photo, and member profile is our NotezWorthy ratings system. Anybody, even non-members can vote on all of our content and talent rating from 1-5 Notez how NotezWorthy it is. On the top of our featured Audios, Videos and Photos pages are our top 10 NotezWorthy charts displaying the top voted in there respective field. Each vote/note voted from 1-5 counts for a point in our NotezWorthy Ratings system. The more points, the higher on the charts, and the more free premiere promotion you receive through MuzicNotez as well as our affiliated promotional network. 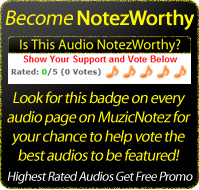 You can be rated our most NotezWorthy, just promote your MuzicNotez profile, and media to your fan base to support you. We have easy share buttons for you to promote your content through FaceBook, Twitter and whatever else you want easily! This entry was posted in Headlinez, HOT Music Topics, MNotez Recommendations. Bookmark the permalink.